It is a wonderful day for spinning and knitting! I am almost done spinning the 3 ply's that will eventually become my socks. It is knit using Cascade 220 Sport in three colors, and size 3 needles. I did modify the hat to be just 6 !/2 inches until you begin the decreases. The gloves are heavily modified. I knit the cuffs and first chart as written, and added a few rows of ribbing to hopefully keep them snug around the wrist. I omitted the strips and will turn them into a shorter version and mitts not gloves. I am hoping to finish them today. I have not worked on the Charleston Tea Cardigan by Thea Colman in a few days. I was busy getting ready for the spinning guild meeting. The first meeting of the new year is always Roc Day. It is a fun time! This is the Evolution Shawl knit by Kathy using 3 skeins Rylie yarn by HiKoo. Its not noticable in the picture but she added some beading to the pattern! It is just beautiful!! Janet's woven fabric and scarf. Unfortunately, I did not take notes but I think that the scarf is tencel and the jacket is cotton. Janet, please correct me if I'm wrong. This is Janet's amazing finishing work on her jacket. WOW! Hope's Claire Cowl, from Outlander. The pattern calls for bulky yarn, but she used 2 strands of a very soft yarn, (again no notes) held together. This is a very soft, very warm and very fast knit! knitting with chop sticks was challenging!! This afternoon, I am leaving the comforts of home and headed to the barn. I will be working with Tom and Greg to worm all of the sheep. At this point they are all in the barn under Tom's watchful eye. On Saturday the 24th we will be shearing, then the watching for lambs will begin. Posted on January 12, 2015 by Carole Foster and tagged spinning knitting cascade 220 sport sportwool rylie fostersheepfarm. What a great day we had, the weather was very co-operative, I worried a little on Saturday that there would be snow in New Hampshire and Gwen would have trouble getting to us. Everything worked out, Gwen made it with no trouble, most of the day we were able to keep the barn doors open, it was so warm, and my help was outrageous! It fell together just like we had planned, just one week later. I know that many of you could not make it this year because of the last minute change of date and I’m sorry for that. The good news for all of you is that we are thinking of changing our shearing strategy. Gwen and I spoke about maybe shearing in the fall and having the open house then. We will need to shear again before lambing, but the open house would be in the fall. We are still in the planning stages of this so stay tuned. This year I was able to stay at the skirting table for most of the day! 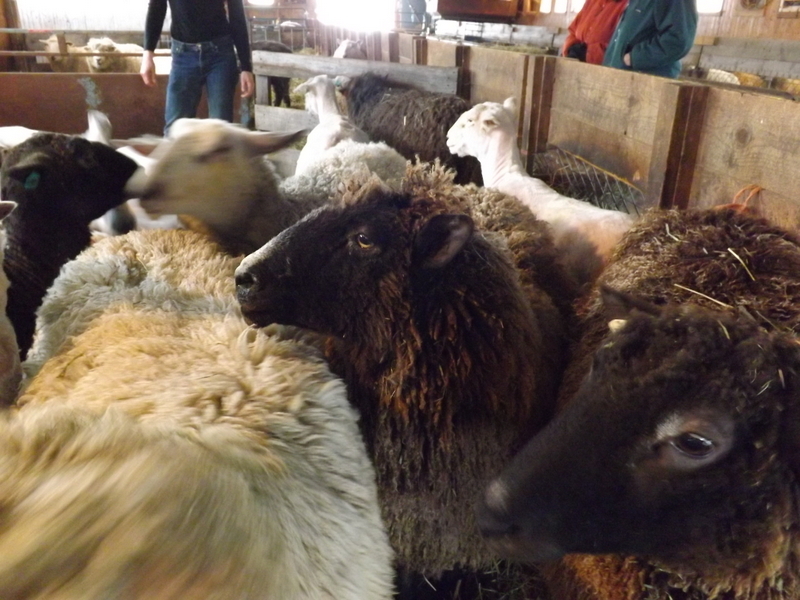 I know it must be a sickness, but how I love those warm fleeces coming right off of the sheep! There is nothing like it! The crimp, the luster, the lanolin! Gwen is such a great shearer she keeps us right on task! Just as soon as you hear the blades stop you must go on to the next fleece. Each fleece is skirted, which means that we remove much of the hay and other debris that has found its way onto the fleece and we grade the fleece by how we feel it will work out for a hand spinner. This year hay was the enemy. The sheep seemed to be having a wonderful time spreading the hay all over themselves and each other. We did score one fleece a perfect 10. We had a few very close 9’s, and many that may work their way into the hands of hand spinners after I spend some time with them. We also selected some very soft fleeces that will be going to the mill to be made into yarn for the knitters. Look for new yarn on the webpage later this year. Now with the fleeces off the sheep it is very obvious that we will be busy in the next month with new lambs. The ewes udders are filling up and their bellies are growing! It won’t be long now!! Many thanks to my barn crew and The Yarn Shop crew! Thank you all for giving of your time to help us and show so many visitors what it takes to get the wool from the sheep to finished product. Most of all thank you Gwen! It is always a pleasure to have you at the farm and to watch you work with the sheep! Posted on February 3, 2014 by Carole Foster and tagged sheep shearing fostersheepfarm.